Pretty tough for such a little car. If you’re in the mood for something a bit more Toyota V8 though, and haven’t already seen it on the Noriyaro Facebook newsfeed, check this video that Motorfix posted of their new 1UZ-powered KE70! 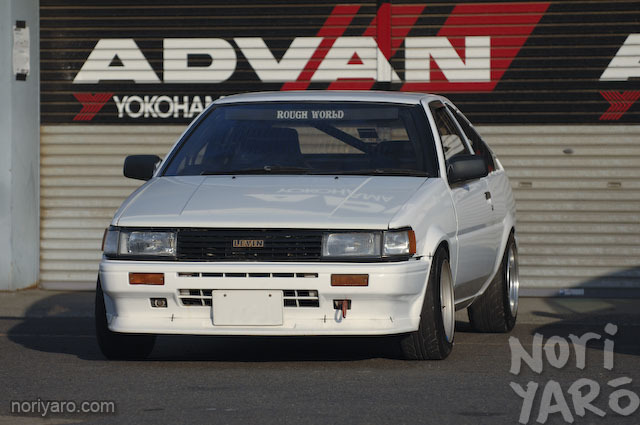 However, if you’re one of those types who thinks that a little FR Toyota like that making a noise that sounds like anything other than a 4A is sacrelige, try Youtube user URC86′s channel, especially this video which contains a little over ten minutes of flat-out nose-to-tail drifting. Here’s a couple of photos from the Hot Version shoot I was at about two weeks ago. The mobile phone picture of Daigo Saito’s “Corveighty” that I put up on the Facebook page seemed to get a fairly strong reaction to say the least, so here’s a better photo I took with a camera. I haven’t seen it run in the dry yet, but in the wet conditions of the day, let’s just say that the squarish new stance looked like it might take some getting used to. 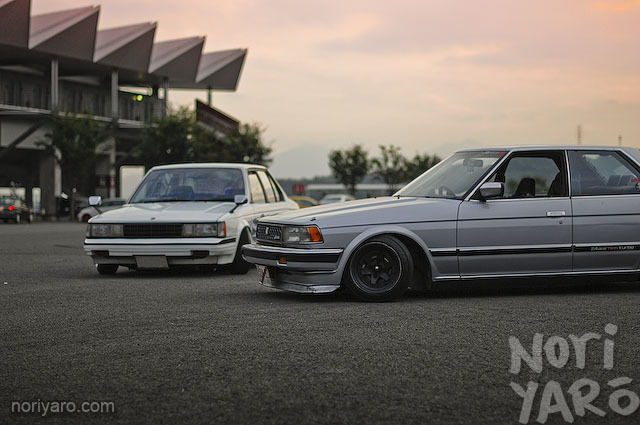 Here’s a couple of guys I met a couple of weeks ago at Daikoku Futo parking area. They’re fans of the Noriyaro column in Drift Tengoku magazine and insisted I take some photos, so I asked them to show me what they thought was the most interesting point was about their cars. You might have seen a bubble shifter before, but have you seen an illuminated one? 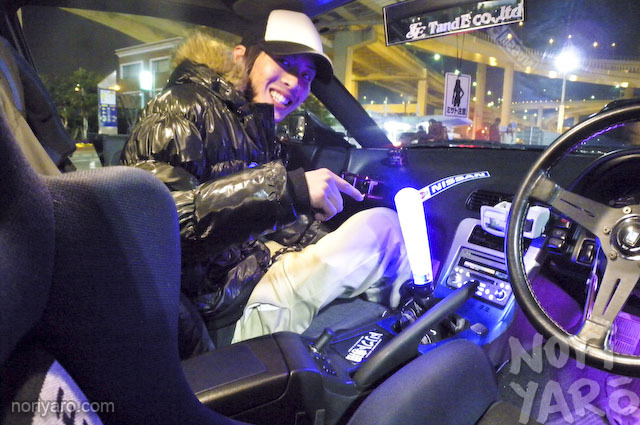 Illumination accessories are actually sold in shops, and it’s like a little ring with double-sided adhesive on them that attaches to the bottom of the shifter, lighting it up. I have one that cycles through rainbow colours (not on the car right now though) and there are ones that have flashing patterns too. 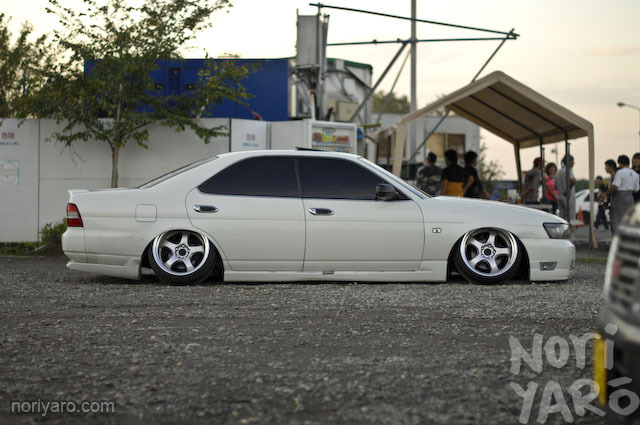 This guy is a big fan of 16-inch wheels and minimal bodykits, early 90′s style. Why does he still rock this look? 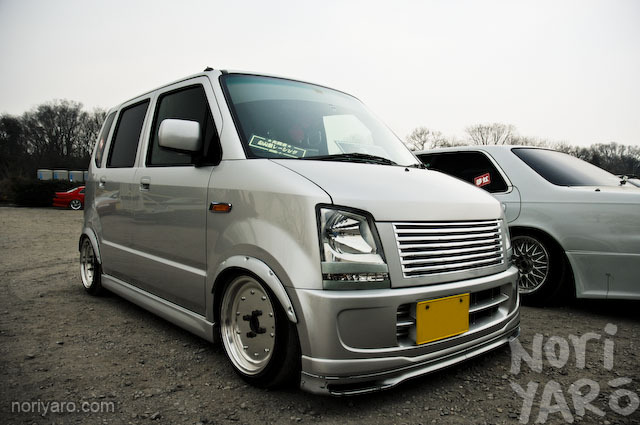 It wasn’t just Porsches at the Rauh Welt meeting at Tsukuba a couple of weeks ago. Here’s something interesting I saw waiting to head out onto the tracks at Nikko Circuit a little while ago. While most cars you see at the circuit have a fairly reasonable amount of modifications, occasionally you see something that’s almost dead stock, wheels included. 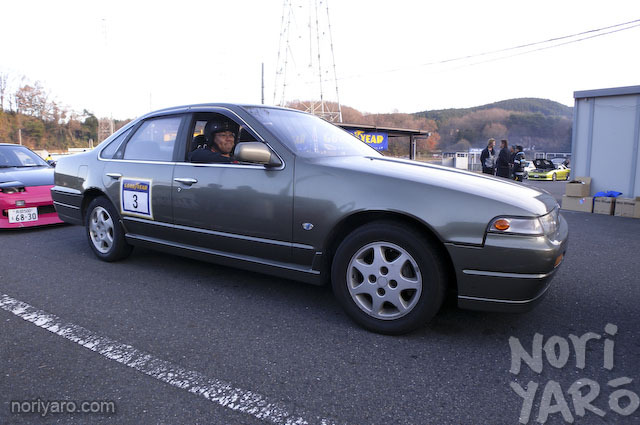 Not only is this A31 Cefiro still in the same shape as when it was delievered, it’s the Autech version that came with a high-flow turbo, different engine tune, custom bumpers and olive paint among other things. 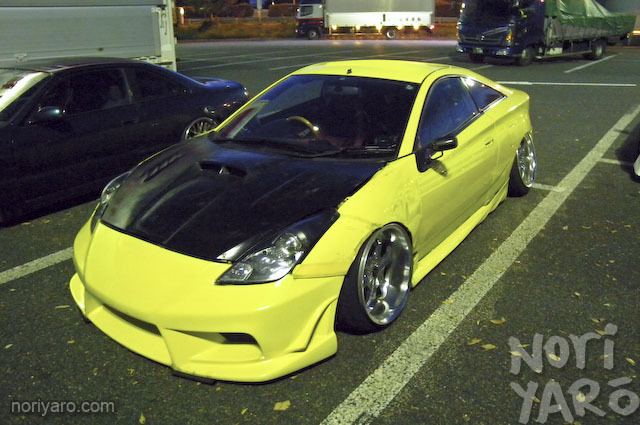 Remember Kawashima-san’s cambered-out ZZT Celica FF-drifter seen in this post? 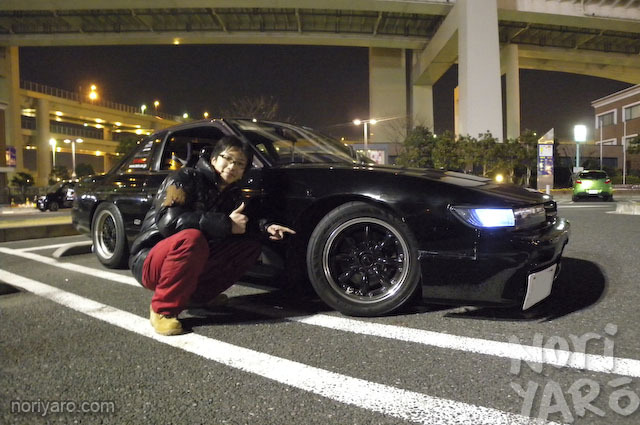 I ran into him on the way to Ebisu Circuit at an expressway parking area a little while back. 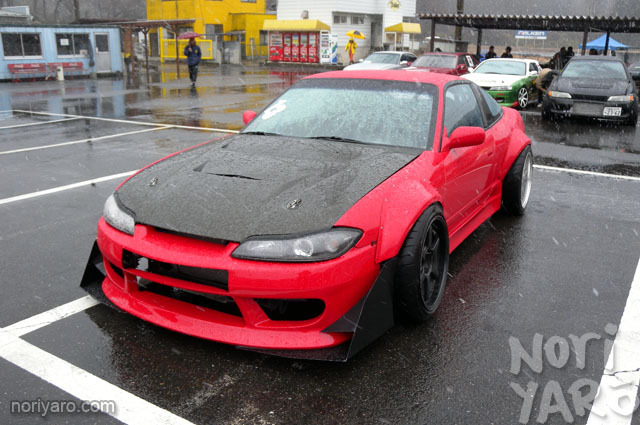 He was on his way to an NA-only meeting at Nikko Circuit. The Celica is running a bit more of an extreme wheel and tyre spec these days though. 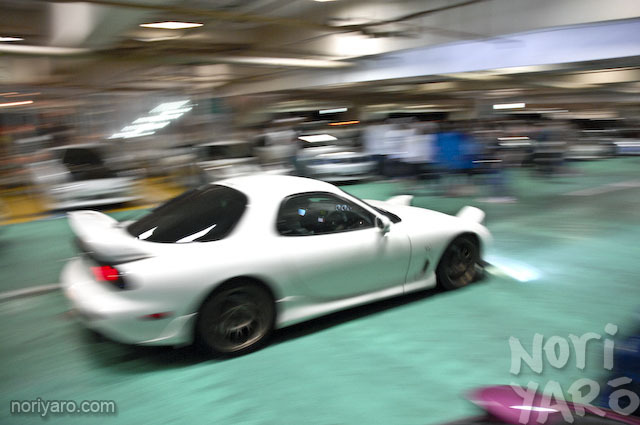 As some of you may know, the day before yesterday being the 7th day of the 7th month, was RX-7 day! I knew that there was going to be a big meeting at Daikoku Futou parking area, so I waited until the peak hour traffic and torrential rain died down before getting out onto the Shutokou and Wangan to head down to Yokohama. Unfortunately, right when I was around Haneda Airport, I saw that dreaded information sign. “Daikoku Futou Parking Area is Closed”. Seriously, the last two or three times I’ve headed down to Daikoku, they’ve shut it down at about nine’o'clock, before I even get there. Usually, it’s because of the kyushakai and kids on bikes that we all know and love making too much noise and generally being annoying to the police. That was usually on a weekend though, but since it was a weekday and I was earlier than the usual closing time, I figured it should be OK, even if they did close it. I made a quick phonecall to Dino Dalle Carbonare, who was also covering the event for Speedhunters. He didn’t answer, but I figured that everyone would probably head out to the Umihotaru parking area in the middle of Tokyo Bay. I didn’t want to waste the three thousand yen toll (that’s $38 Aussie and $33 US) going there if nobody else was though, so I slowed down behind a truck and called Dino a couple of more times. I got through to him literally as I was passing the off-ramp to Umihotaru, and just barely made it on. It turns out that so many cars showed up to Daikoku that they were blocking the on-ramps and causing trouble for the truckers and bus drivers who are the usual attendees of expressway parking areas, so the police kicked them all out. A few minutes later, I was at Umihotaru, which was only populated with a few dozen groups of people out on a night drive. They had no idea what was soon to decend upon them.